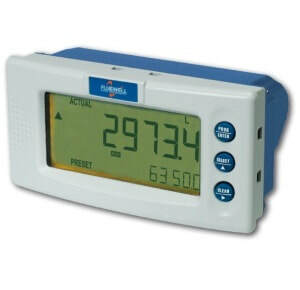 The Fluidwell D030 is a basic, panel mount batch controller. The operator can enter a batch quantity easily or execute repeating batches. During the batch, the preset value is displayed as well as the batched (or remaining) quantity and the units of measurement. The automatic self-learning overrun correction will ensure an accurate result each batch again. Unique, robust IP66, IP67 (NEMA4X) panel mount front enclosure made of die cast aluminium, allowing even big jets of water and total immersion. Programming can be done by your own crew with the exact same, plain and sensible menu-driven structure like the F-Series, saving cost and irritation. Know one Fluidwell product, know them all! Fluidwell’s D-Series encompasses an extensive selection of panel mounted indicators, controllers and monitoring systems for liquid and gas applications such as flow, level, pressure and temperature measurement in industrial environments. In addition to simplicity and user-friendliness, Fluidwell’s D-Series offers a unique feature in DIN panel mount indicators – a IP66, IP67 (NEMA4X) enclosure which can withstand powerful water jets or even total immersion. The functionality coverage of the D-Series is extremely impressive: Within the product overview you can get flow computers, process controllers, indicators, totalisers, batch controllers, transmitters and monitoring systems for flow, level, pressure and temperature measurement. Icenta Controls have got a great new Fluidwell configurator tool to help making your decision easier when deciding on a product for your organisation. Head over to the Guides and Tools section of the site and take a look now! If your organisation requires five or more D Series units, please contact our team of experts for a quotation.